Posts tagged " Body detox "
Ejuva Cleanse Review: Phase/Week 3! 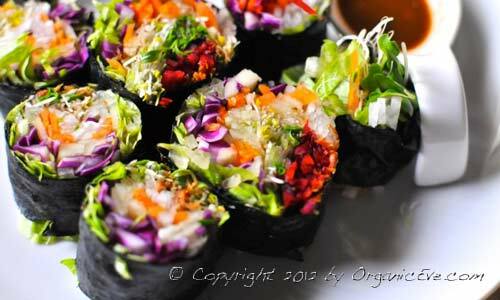 In week 3 on the Ejuva cleanse, we could only have one meal – I chose lunch! We will be replacing both breakfast and dinner with cleanse dosages (tablets and shake). Read on about my cleansing reactions and more weird findings in the bathroom! Ejuva Cleanse: Home made lunch during the cleanse! I also started Para Nix (Ejuva’s Parasite Cleanse), the 2 weeks homeopathic and liquid herb cleanse that destroys most types of parasites including their eggs. It complements the Ejuva Cleanse and falls nicely into its 3rd and 4th week. This is the first day we felt that we are seriously constipated. I went to the bathroom two times this morning, Adam went just once. And that’s it! That is pretty much the least output we had since the beginning of the cleanse. If you have been following our cleanse diary, you would know that we visited the bathroom 4 to 5 times every day during the first 2 weeks of the Ejuva cleanse. Were we dehydrated or did we do something wrong. I missed applying Vibram (pure plant oils) today. Could it be the culprit? Adam felt extremely tired, he even have difficulty concentrating. I was tired in the morning and actually overslept by 2 hours, but I was an energizer bunny for the rest of the day. We felt constipated still. Dehydrated. We went out to buy a slow (cold press) juicer. (finally, after a few months of research!) We started to mix apple juice with combi, rather than just water. That did the trick. We felt like an energizer bunny again. Nothing much came out. Twice in the morning. One small one at night. Output is braided, sort of like chinese candy or sweet bread. We are very excited about juicing and started to stock up several pounds of organic apples and other fresh fruits. Luckily we live in Singapore where fresh fruits are in abundance. However, organic fruits are hard to find and expensive! We managed to buy a few pounds of organic New Zealand apples on sale in NTUC for $4 a kg (2.2 pounds), that’s a steal! 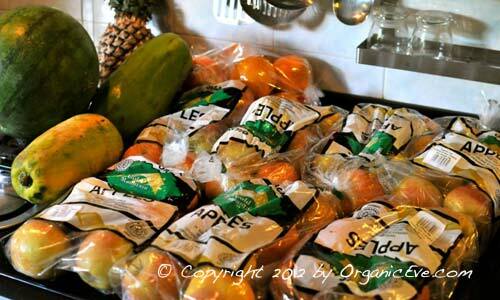 Ejuva Cleanse: Organic Apples and other fresh fruits for juicing! A friend asked me last night if I had any healing reactions. I think I didn’t have any, except for the occasional burst of energy. Re-reading the instructions again, I increased all my dosages to the maximum to 3-5-5 for the herbal tablets and 3 scoops for combi for better cleansing. We ran out of organic apples, so we started juicing guava and star fruit for the combi mix. For the “dinner juice cup”, we added lemon. We basically juice out what we have in the fridge. Time to stock up! By evening time, I have a mild headache. It’s not too serious but noticeable. By night time, I have developed a slight fever. Are these cleansing reactions? Adam is able to go to the bathroom again after increasing his water and juice intake. He also felt more energetic though he is still tired in the evening. I went to the bathroom 4 times, all output were in awkard shapes. I was expecting to see long stringy ones as “muciod plague” that I saw online. But I guess this is it! The awkard shape ones had to be the muciod plague, different colours, braided and sometimes with “springy” things around them. There were also pebble-like-segments which looked like they have been cast in “intestinal moulds”. I also saw dark little rice thingy, like undigest red rice. The last output was multi-coloured, brown, light brown and beige (surprise)! I’m tolerating the increase dosage quite well so far. No serious healing reaction. We ran out of organic apples again and went out to stock up with a wider variety of fruits and vegetables. Today is a mess-up day. I went out for lunch with a friend without taking my afternoon dosage. I ended up buying 3 cups of juices in the afternoon. I started my second dosage only at 8pm and third dosage at 9:45pm! I felt a bit weak and light headed in the evening time. Probably, I had too many tablets in just a few hours. I have to remind myself that I cannot have any drink except for water and juice. Went to bathroom 3 times today. Somehow I noticed that my occasional nose dripping is clearing up! However, I also noticed a thick white coating on my tongue. It definitely does not look normal. Is that my body’s way of expelling toxins? I went out for dinner with family. Yes, I remember I’m not supposed to eat dinner. I drank only sparkling water. Even though my nose drip is clearing up, I felt that my nose is extremely itchy. Could it be caused by parasites trying to escape? I know I know, my imagination is running wild…but it is a possibility right? Woke up at 1am to pee, just like the last 2 days. Decided to extend phase 3 for another week due to Adam’s cleansing reactions. Felt somehow constipated. Drank a lot more water. We accidently drank black tea during lunch! Opps, I know we are not supposed to. Went to the bathroom in the evening and noted a lot of muscusy and stringy stuff. They looked like chicken tendons or some tendon like things. Might be undigested food, fiber or ascaris roundworms?? I’m not sure if I have enough tablets so I decided to extend phase 3 for only 2 more days and start Phase 4 after 9 days of phase 3. Noticed the white coating on my tongue came back! Went to the bathroom 3 times. All different textures. First was more formed and solid, sinked. Second was softer and multi-coloured, sink. Third was floating fluffy cloud. Felt feverish again. I think I’m running a slight fever. We ran out of organic apples. So we decided to try conventionally grown apples, pears, pineapple and water melons. 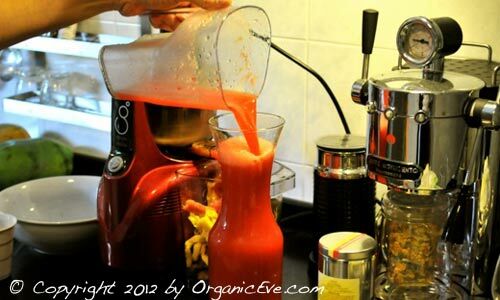 We ended up spending a lot of time cleaning and juicing fruits! The itch in the nose continued and the nose drip came back at a vengence and became worse at the end of the day! Am I hungry eating just one meal a day? Surprisingly not. I guess the Ejuva Cleanse Manual is right, the secret of success in the cleanse is to have a cup of juice constantly at your hand and sip it around the clock! I’m glad I adhere to it. A golden tip from me? Get a “Cleansing Buddy”! One last week on the Ejuva cleanse! 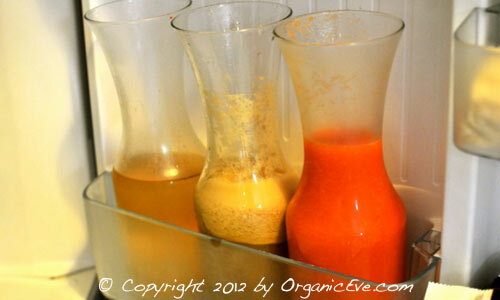 Ejuva Cleanse Tip: Have a constant supply of juices in your fridge! 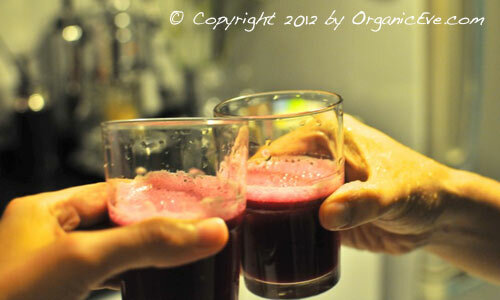 Another Cheers to my Cleansing Buddy! Why do I pick Ejuva Cleanse over so many cleanse kits in the market? Read “Parasite Cleanse & Detox”. Do you have parasites in your body? Find out if you have any of the symptoms in “War against Parasites”. In my usual research vigour, I kick started my research on parasite cleanse again, yet again in the past few years! If you have tried googling ‘Parasite Cleanse’, there are tons of brands and formula out there. Plus I’m super particular of products that I consumed or apply on my body. I’m a serious skeptical health freak in this instance! A lot of products came in tablets or liquid form and I’m not really sure what goes into it. Are the ingredients they use organic or even properly cleaned before packaging? Are the products going to do more harm than good? It’s hard to find a product when I don’t have a concrete list of criteria. Black walnut hull and wormwood kill adults and developmental stages of parasite. Cloves kills the eggs, that is why all three must be used together in a single treatment to eradicate parasites. Most pharmaceutical drugs kill the adults, but not the eggs, which will be left in your body to develop into adults and lay more eggs. The cycle just never ends! There are several products in the market that provide rather ‘gruesome’ pictures on their websites, monstrous green slimy stuff! I don’t know if that really came out from their customers’ bodies or just simply the ‘cleanse mixture’ transiting through the digestive systems and reappearing as the green slimy stuff. Meaning, what came out is what went in — the ‘dirty gut’ is still not clean! (hey, it rhymes! )There is simply too much hype in the market and consumer money is pouring in. I avoided these products. Senna is one product to be avoided in your cleanse, as it is a laxative used to irritate the colon to alleviate constipation. It sure sounds habit forming and I do not want that in my cleanse. As I look closer, I eliminated Blessed Herbs as it contains the controversial bentonite clay in their ‘Toxin Absorber’. Bentonite Clay is made up of 20% aluminium. It is controversial if the aluminium could be absorbed by the body during the cleanse. However, since I have a choice, I would choose to avoid that. I want to rid my body of metals not to introduce them! I eliminated Nature’s Secret because its ‘Parastoy’ contains gelatine. I’m a full vegetarian, so that’s out. Final round: Ejuva, PBIV and Renew Life (ParaGone) and are all serious contenders. PBIV looks promising but contains added ingredients or fillers (e.g., silicon dioxide or silica.) Stearic acid, one of the added ingredients could be from animal source, which for me is a big concern. And there are other health concerns that stearic acid and magnesium stearate (both by-product of hydrogenated oils) might not be safe for consumption. According to this article, it is highly toxic for consumption, even though 90% of supplements contain them in order to lubricate pills for increased pill production. Check your supplements just to be sure! Renew Life’s total body cleanse has 100% organic products & fibre and it is 100% vegetarian. It also has a lot of great reviews online. However, it does not have supplementary probiotic products in their cleanse. You have to buy them separately on their website. So KIV on this. It is 100% organic or wild crafted whenever possible. It is 100% vegan and raw. It does not contain bentonite clay. And I do buy their theory that cleansing cannot be done over just a few day or a week as our body just simply cannot take the onslaught of toxins. Their program takes one month. I also like that they have integrated both the cleansing kit and the parasite cleanse. The products are also free from fillers, synthetic flow agents, not sterilized or gassed. So finally, after years of on-and-off research I got the Ejuva Cleansing Kit (body detox) together with the Para Nix Kit (Parasite cleanse) for myself and Peter. Can’t wait for the products to arrive in Singapore for us to start the cleanse! Please Don’t Do This In the Bathroom if You Baby Wear! Ejuva Cleanse Review: Week 2! Copyright 2017 Organic Eve. All rights reserved.